Craig Mackail-Smith (right) celebrates a goal for Posh against Bristol Rovers. Photo: Joe Dent/theposh.com. Peterborough United legend Craig Mackail-Smith is convinced he can play at a decent level for a few more years. 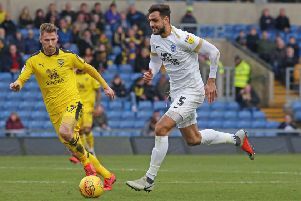 The 33-year-old believes he’s proved his fitness during a four-month loan spell at Posh this season. He’s scored five goals - including his 100th for the club - in 17 appearances (14 starts) since returning to London Road for a third spell on from League Two promotion-chasers Luton in January. Craig Mackail-Smith in action for Posh against Bristol Rovers. Photo: Joe Dent/theposh.com. Mackail-Smith is out of contract at Luton at the end of the season. Neither the Hatters nor Posh have made him an offer for next season. “I’m grateful to Grant McCann, the chairman and Barry Fry for giving me the opportunity at Peterborough,” Mackail-Smith said. “I was telling the people at Luton I could still perform, but it was always getting the chance to prove it that I needed. “And I believe I have proved it now. I feel fit and strong and I’m happy to have scored some goals. For me it’s a shame the season is coming to an end because I’m getting better and the Posh players are getting more used to the way I like to play. “I’ll take a few weeks off after the last game this weekend and then speak to Luton to find out my situation and take it from there. “I believe in myself and I don’t believe in age. I’ve looked after myself and I’ll carry on looking after myself as I think I can have a few more years at this level. Clubs might look at me and see I’m 33 with a record of injuries, but I hope my form with Posh will show them I’ve still got plenty to offer. “I still love playing football and playing for Posh is just a bonus. “I don’t know what the situation is with the Posh chairman, but I love this club, I have a family tie here (his partner Amber is Barry Fry’s daughter) and it’s been fantastic to come back and play for them again.